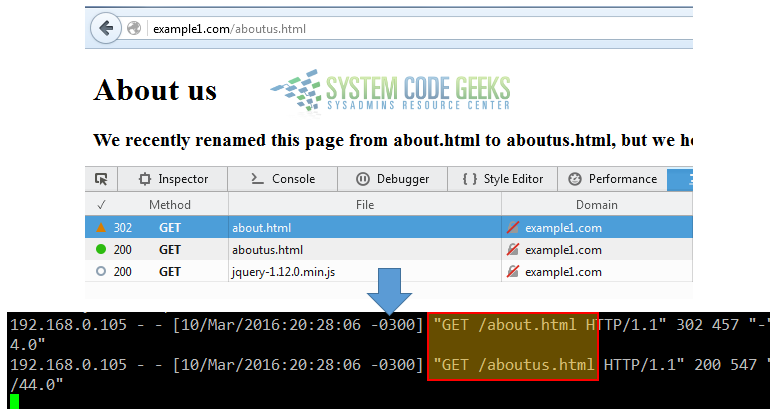 In this post, we feature a comprehensive Apache URL rewrite example. This article is part of our Academy Course titled Apache HTTP Server Tutorial. In Apache mod_rewrite example: Redirecting and rewriting URLs, we introduced you to Perl Compatible Regular Expressions (PCRE) and explained how to integrate them with the mod_rewrite Apache module. These tools allow us to perform URL rewriting and redirecting for a variety of purposes at our convenience. In this tutorial we will build on these concepts and share other examples of URL rewriting you should have handy as a system administrator. If you have changed the name of a page and want both the old and new URLs to be functional (meaning both lead to the new URL), mod_rewrite allows you to get the job done in a transparent way for end users, who will not notice the difference in their browsers. In this example we will use the example1.com virtual host. For simplicity, let’s suppose that we had a page named about.html and we renamed it to aboutus.html. Since we do not want users to notice the change, all requests to about.html must be rewritten to aboutus.html. In this last case, the [R] rewrite flag is used to cause the HTTP redirect to be issued to the browser. The 302 HTTP response indicates that the browser is “told” to make a second request to the new URL. This behavior can be see in Fig. 2 above. If for some reason you need to move a page (or any kind of file, for that matter) to a different server, you will want your users to still be able to access that resource by browsing to the usual URL. This option may come in handy if you need to move a site between servers, or to leverage the available bandwidth of the second system. In Fig. 4 we can see that the request to http://example1.com/video.mp4 was actually handled by example2.com. The combination of the R and L flags in the rewrite rule tells Apache to 1) perform a redirect, and 2) disregard further rules, respectively. You will notice that the regular expressions used in the above rewrite rules look for a match inside the user agent string (which can be rather large, such as Mozilla/5.0 (Windows NT 6.1; rv:44.0) Gecko/20100101 Firefox/44.0). Depending on the browser, a different page will be displayed when the user requests http://example2.com/scg.html (note that this file does not exist in the DocumentRoot of this virtual host). If the browser is neither Firefox, Chrome, IE (identified by the string Trident) or elinks, the request will be redirected to index.html. In this article we have shared a few extra examples of URL rewriting and redirecting with the intent to give you a glimpse of the capabilities of mod_rewrite. Fortunately, the Apache website provides lots of useful information and examples about the use of this module. With that in mind, the sky is the limit! We hope that you have found this tutorial useful.